In Part 21 of AngularJS tutorial we discussed using anchorscroll service with hardcoded data. In this video we will discuss using angular anchorscroll service with database data. So here is what we want to do. 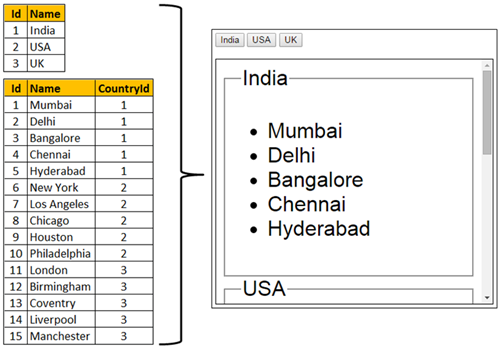 Retrieve the countries and cities data from respective tables in the SQL server database and display it on the web page. When we click on a country button, the page should automatically scroll to the respective country and it's cities. Step 2 : Create new empty asp.net web application project. Name it Demo. Step 3 : Include the following settings in web.config file. Step 4 : Add a class file to the project. Name it City.cs. Copy and paste the following code. Step 5 : Add a class file to the project. Name it Country.cs. Copy and paste the following code. Step 6 : Add a new WebService (ASMX). Name it CountryService.asmx. Copy and paste the following code. Step 8 : Add a new stylesheet to the project. Name it Styles.css. Copy and paste the following styles in it.